Excellence Through Equity is an inspiring look at how real-world educators are creating schools where all students are able to thrive. In these schools, educators understand that equity is not about treating all children the same. They are deeply committed to ensuring that each student receives what he or she individually needs to develop their full potential—and succeed. They further emphasize that the practices are grounded in three important areas of research that are too often disregarded: (1) child development, (2) neuroscience, and (3) environmental influences on child development and learning. You’ll hear from Carol Corbett Burris, Michael Fullan, Marcus J. Newsome, Paul Reville, Susan Szachowicz, and other bold practitioners and visionary thinkers who share compelling and actionable ideas, strategies, and experiences for closing the achievement gap in your classrooms and school. Ensuring that all students receive an education that cultivates their talents and potential is in all our common interest. As Andy Hargreaves writes in the coda: "The opportunity for all Americans is to articulate and believe in an inspiring vision of educational change that is about what the next generation of America and Americans should become, not about a target or ranking that the nation should attain." "Letting go of a system of winners and losers in favor of what is proposed in this book is a courageous leap forward that we all must take together. Let this bold, practical book be a guide; and may you travel into this new exciting vista, in which every child can succeed." "Equity is not ensuring that all children receive the same thing, but ensuring that every child gets what he or she needs in order to succeed. Pedro Noguera and Alan Blankstein provide examples of how courageous Americans are taking this charge head on by illustrating how excellence through equity can be achieved. To ignore this issue means to undermine the future of our children. This book is a must-read for teachers, principals, administrators, policy and business leaders, and parents—or anyone interested in becoming champions for children and strengthening our nation’s public education agenda." "Pedro Noguera and Alan Blankstein’s book should be on the shelf of every school leader and community member who is committed to providing exceptional educational opportunities for all. Excellence Through Equity is a well written combination of research, philosophical approaches, and practical effective implementations." "In the United States, as population decreases and the percentage of poverty levels of children increases, it is critical that policy makers, schools, and communities galvanize their work toward equitable educational outcomes for our children. This book provides a range of perspectives that will inform the work and inspire courage in those that can make it happen." "Amidst the confusion created by a highly polarized country, sound educational policies and practices have become as uncommon as bipartisanship. In the cacophony that marks the current education debates, Noguera and Blankstein demonstrate that there need not be a choice between excellence and equity but that the two are complementary and necessary. Their stories of school transformation told by teachers and other leaders are compelling and show us the way to a new paradigm." 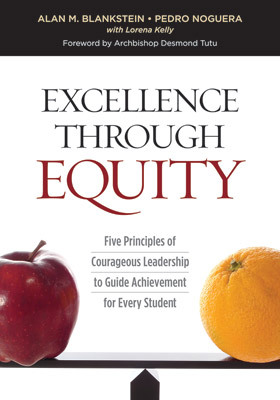 "Excellence Through Equity is an exemplary look at how educators across the country are tackling today’s issue of equity to ensure all students not only have the opportunity to learn but excel. A great read for all those interested in providing the best possible education to all students!" "This book provides timely insights and powerful examples that educational equity and excellence is necessary and possible. In addition, the stories of courageous leadership and persistence amplify what is required from each of us to achieve sustainable and lasting change in public education." "Education is not something we do to children; it is something we do with children. Children are the travelers on an educational journey. We are the tour guides. Each traveler comes with a different set of luggage and as a tour guide we need to help provide them with the best accommodations, modifications and enrichments to help them maximize their journey. As they send out their postcards, we want to make sure each is full of equal opportunities! You see these are our future tour guides and they will design future destinations for the travelers who come." "This book comes at a time when we are experiencing unprecedented inequality throughout American society and, in particular, in education. The recommendations in this book, if implemented at the state, federal and school district level, could change the trajectory in which we are now heading that threatens to create a social tsunami that will impact the lives of every citizen in America." ALAN M. BLANKSTEIN served for 25 years as president of the HOPE Foundation, which he founded and whose honorary chair is Nobel Prize winner Archbishop Desmond Tutu. A former high-risk youth, Alan began his career in education as a music teacher. He worked for Phi Delta Kappa, March of Dimes, and Solution Tree, which he founded in 1987 and directed for 12 years while launching Professional Learning Communities beginning in the late 1980s. He is the author of the best-selling book Failure Is Not an Option®: Six Principles That Guide Student Achievement in High-Performing Schools, which received the Book of the Year award from Learning Forward. PEDRO NOGUERA is a Distinguished Professor of Education in the Graduate School of Education and Information Sciences at UCLA. His research focuses on the ways in which schools are influenced by social and economic conditions, as well as by demographic trends in local, regional and global contexts. He is the author of eleven books and over 200 articles and monographs. He serves on the boards of numerous national and local organizations and appears as a regular commentator on educational issues on CNN, MSNBC, National Public Radio, and other national news outlets. LORENA KELLY is an assistant principal in Virginia Beach, Virginia. She began her career in education as an elementary teacher. After 9 years of teaching, she became an instructional specialist. Her interest in curriculum, specifically literacy, led to a position as a language arts curriculum coordinator. She used this opportunity to work with colleagues and partners to enhance learning for all students. She continues to follow her dreams by returning to a school as a school-level administrator.